Getting a mortgage loan nowadays can become an obstacle if you don’t know what you’re heading towards. Although the mortgage rates were at their record low levels throughout a long period of time, now is the time for the interest rates to rise yet again and so if you’re someone who is looking forward to taking out a mortgage loan, you need to take some vital steps. If you aren’t aware of the steps that you need to take, here are some that you may consider. • Examine your personal finances: The first task that you need to do is to examine your personal finances so that you may know where you’re presently standing. Check your total monthly income, your total monthly expenses and then compare it to the loan amount that you’re taking out and the monthly installments that you’re supposed to pay. Unless you know your mortgage afford ability, you won’t be able to decide the loan amount to choose. • Shop around and get multiple quotes: As there are too many mortgage lenders who are waiting to offer you their loan products, you should shop around and compare and contrast the rates that are being offered. Choose the loan that offers an affordable price, the right kind of terms and coverable closing costs at the same time. Don’t rush into accepting the offer that comes first. • Take a look at your credit score: Your credit score is something that is checked by the lenders before lending you a home loan and in case you don’t have a good score, you shouldn’t approach a mortgage lender as it is pretty obvious that he will deny your offer. Conventional lenders demand a score of 700 (+) and FHA lenders demand a score of minimum 600. If you don’t have these, take credit repair steps. Apart from the above mentioned points, you should also take into account your DTI ratio and make sure that it isn’t too high. If the ratio between your debt and income is too high, this will imply that you won’t be able to make payments on time. Lower your DTI ratio and then approach a mortgage lender. 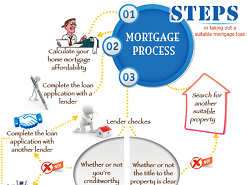 This might not be all of the steps you need to consider before getting home mortgage loan, but these are the most important steps you should khow.